Authored by: Dampskibsselskabet "NORDEN "A/S, Copenhagen, "Norden News Winter 2006"
On the trip through life, being a marine engineer offers many different avenues. It began by coincidence, but ended up as a career path. Having been posted at shipyards in Korea, Japan and China for more than nine years, Niels J�rgen Iversen has been one of NORDEN�s most well-known faces in Asia - and one of the employees launching the most of NORDEN�s vessels. But a new chapter is about to start for him, back in Denmark. At the beginning of the new year, Niels J�rgen Iversen will hand in his discharge book and retire. This is his story of a long, varied career with NORDEN. �It was something of a coincidence that I started supervising newbuildings,� explains Niels J�rgen Iversen, who trained as an engineer and was employed by NORDEN in 1986. �For the first three years of my employment with NORDEN, I was chief engineer of m.t. NORDTRAMP. We traded in tropical waters, and were in the Persian Gulf during the Iran-Iraq war. Then, suddenly, in 1990 I was given the opportunity to go to Hyundai Shipyard in Ulsan, Korea to supervise the building of the Capesize bulkcarriers NORD-ENERGY and NORD POWER and to experience daily life under distant skies. We had to give it a try, and my wife, Kristine, and I settled in Korea for almost a year�, he continues. �This stay gave us a good idea of what living abroad is like, and it was a huge experience for us both. But it was also an enormous challenge, professionally. As NORDEN�s representative at the shipyard, I and the rest of the team are responsible for supervising the various phases of the vessels� production. Will it be built in accordance with specifications? Will the schedule hold, and is the quality as expected? There was a lot to follow up on. In the early 1990s, Korea was a very young shipbuilding nation, which had far less experience in shipbuilding and project management than countries such as Denmark and Japan had at the time, and which Korea has achieved today�, he explains. When both vessels had been completed in the spring of 1991, Niels J�rgen and others sailed NORD POWER back to Denmark, and he spent the rest of the year as chief engineer aboard this vessel. Since his time at Hyundai Shipyard in Korea, he has launched a further fourteen of NORDEN�s newbuildings and spent a total of eight more years in Japan, Korea and China. In 1992 followed a brief stay at Shin Kurushima Dockyard in Japan. This shipyard had already launched the Aframax tanker SKAUNORD, but the final adjustments and most of the fittings had to be supervised. Niels J�rgen Iversen was given this assignment. Originally, he was to have been chief engineer aboard the vessel in its planned bareboat charter operation, but SKAUNORD ended up in time charter, manned by the shipowners themselves. For the next five years, Niels J�rgen was instead chief engineer on the Capesize bulkers NORD-ENERGY and NORD POWER. In 1997, he also worked as chief engineer on NORD FAST and NORD-ENERGY. When NORD-ENERGY called at a port in South Africa toward the end of that year, he was asked to go to Ulsan, Korea for another shipyard assignment at the Hyundai Shipyard. This time, he was to supervise the finishing work on the Aframax tanker NORDASIA. Assignment completed, Niels J�rgen sailed NORDASIA to China and back to Korea, and subsequently stayed on as chief engineer for two voyages. Since then, shipbuilding has been the order of the day. In the Japanese countryside From 1999 to the beginning of 2001, Niels J�rgen and Kristine were at the Oshima shipyard in Japan. This shipyard is located far from the beaten path in the south-western corner of Japan, between Nagasaki and Sasebo. Here, Niels J�rgen and Kristine became good friends with many locals and learned to appreciate Japanese nature, culture and food � including �sashimi� (raw fish) and �sushi� (which really means rice cake, but which in our culture has become synonymous with �raw fish�). They also became familiar with the custom of kneeling at dinner in restaurants, although it got harder with age to get up again, as Niels J�rgen explains. 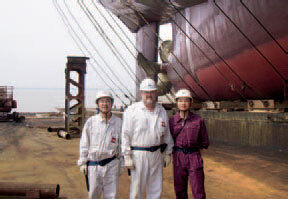 At the Oshima shipyard, Niels J�rgen supervised the building of three Handymax bulkcarriers. NORDEN itself acquired NORD CECILIE (delivered in August 2000), while the two other vessels were delivered directly to a Greek shipping company. For the next two years, Niels J�rgen Iversen worked at Sumitomi Shipyard in Yokusoka, south of Yokohama in the Tokyo Bay and, unlike Oshima, this shipyard was located in an industrial, urban area. �Initially, we were not happy about the prospects of moving away from the peace and quiet, closeness and our many new friends in Oshima, but the reality proved quite the opposite. It was, in many ways, a fantastic time. The shipyard was very well organised, and all employees � from the dock workers to the most senior office workers - were highly skilled and very friendly. Socially, there was also a great community spirit and a lot of leisure activities and trips were organised for all employees at the shipyard. For example, we went on a trip to a volcanic area offering, among other things, Japanese hot baths and instruction in the special rituals associated with these. In the hotel room, my wife and I searched in vain for the beds, until we discovered sleeping mats in the cupboards. As it turns out, this is quite common in many Japanese hotels. We slept perfectly comfortably on the mats, anyway. We drove the 12-1300 kilometres from Oshima to Yokusoka in NORDEN�s car. This was a great nature experience with varying landscapes,� he explains. to Denmark for a period while Niels J�rgen received intensive rehabilitation treatment to his hand at the hospital in Viborg. By the autumn of 2003, Niels J�rgen was ready for another stint abroad � this time at the Oshima shipyard in Japan where he had worked two years earlier and was now to supervise the Handymax vessel NORD AMALIE, which was sold to Dubai on completion. From the summer of 2004, the address became Mitsui Shipyard in Chiba, Japan. This shipyard was to construct three Handymax bulkcarriers, of which two were sold on while NORDEN kept the third (m.v. NORDEN). In January 2006, Niels J�rgen and Kristine moved to China � or more specifically to the Chengxi Shipyard in Jiangyin by the Yangtse River, 200 kilometres west of Shanghai. Here, Niels J�rgen supervised the building of m.v. NORD MARINER, which was delivered on 28 July 2006. �This assignment in many ways resembled the one I took on in Korea around 1990, as China is also a young shipbuilding nation � when it comes to modern steel vessels. You need to be very careful, follow up on all details and be on your toes. You should not expect the vessel to be built in accordance with specifications in every detail. But I � and the rest of the team at the shipyard � have to make sure that it is. That�s what we�re there for. It is possible to end up with a good product if you follow up closely on a daily basis,� states Niels J�rgen Iversen. �After a few months in China, we made a number of Chinese friends. At first, the language barrier created a lot of distance, as few people speak English. But everyone is very friendly and interested in contact. At the Chengxi shipyard, NORDEN has three Chinese inspectors, and it�s enormously important to be able to speak with everyone directly. That is how you achieve good results,� he explains. 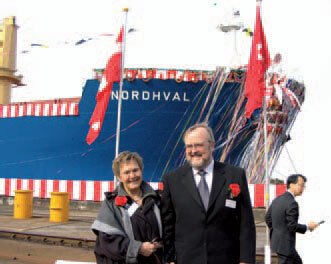 After seven years in Japan, two in Korea, six months in China and ten years at sea for NORDEN, Niels J�rgen Iversen is now retiring, handing over the helm at the Chengxi shipyard to Mortan Gaasedal. �It is incredibly important for NORDEN to be present locally, where things are happening, and to show empathy, whether in business deals or in ensuring the progress and quality of our newbuildings. This generates mutual respect and understanding of each others� views, which is essential to successful cross-national and cross-cultural collaborations. In this respect, Niels J�rgen Iversen has been an outstanding representative throughout all his years with NORDEN�, says Jacob Meldgaard, Senior Vice President of NORDEN�s dry cargo department and overseas offices. NORDEN News Magazine presents the latest news on NORDEN�s strategy, activities and organization to customers and employees all over the world.